We often have friends over with differently aged children and I like to put something out for the younger kids so if the older ones are busy with K’Nex or a game that is a bit more complicated then the younger siblings can still have something fun to keep them occupied. My go-to activity is normally a crafty one and one of my favourite crafts has to be tissue paper. I like it because it is easy to set up – print a few templates or basic colouring pages, grab the box filled of tissue paper, some glue and possibly a jar of water and paintbrush (for those you want to try and bleed the tissue paper) and you are set. It is quick to set up and it normally does not create too big a mess – although if the kids do bleed the tissue paper some of the colour does sometimes end up on their hands but it is super easy to wash off. On a recent playdate I printed out the robin colouring page for the younger siblings – we have two robins in our garden that our friends know about so the robin theme is a very popular one at the moment. The younger kids had actually seen another bleeding tissue paper craft that my daughter was working on and they were keen to try the same thing with their robins. The photo below is a piece of A3 card after my daughter bled some tissue paper onto it – she uses the colourful card that she creates to make birthday cards and pictures for friends. When we bleed our tissue paper I always print the pictures onto card because some the kids apply a LOT of water and paper sometimes gets too wet and tears. Then we apply the dry tissue paper to the picture and “paint over” it with water. I have found that some colours bleed better than others. Our brown tissue paper did not give the same colourful effect as the blue. 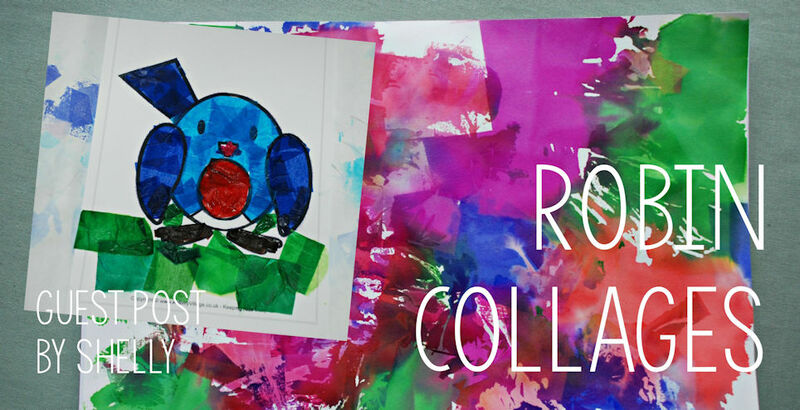 One of the older kids also tried a robin picture but she went for a combination of watercolours and scrunched up tissue paper glued onto the page. With this we suggest they first paint using the watercolours and then add the tissue paper to the other sections – if they add the tissue paper and then try and paint you often end up with the bleeding tissue paper effect even though they did not want to bleed it.